In the aerospace business risk is impossible to eliminate; but, it can be managed. Risks abound and fall into numerous categories. For purposes of this article, the focus will be on technical risk, cost risk, and risks associated with potential mishaps. Figure 1. NASA’s Technology Readiness Levels Scale, image taken from Understanding Space: An Introduction to Astronautics, 4th Edition, copyright 2014 CEI. Used with permission. 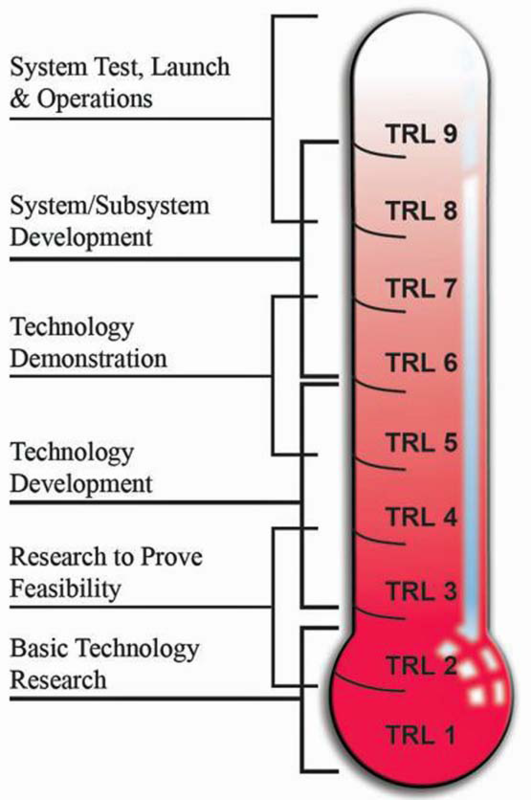 NASA, DoD, and many other organizations characterize technical risk using Technology Readiness Levels (TRL)—see Figure 1. TRL’s are used to evaluate and manage the inherent risk in adopting emerging technologies. Lower TRLs require further development before they are accepted for use in space systems. 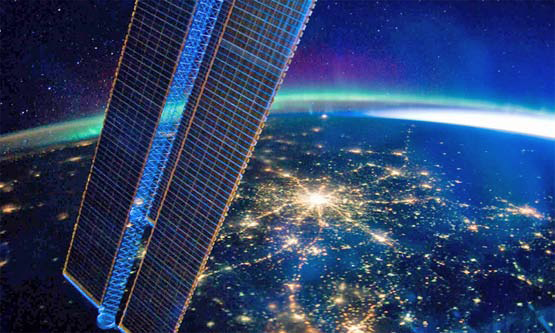 For decades, small satellites and, most recently, cubesats, have proven themselves as low-cost test beds for advancing new technologies up the TRL ladder, reducing the risk of adoption by larger, more expensive programs. Thanks to the small satellite phenomenon, the cost is lower and the task is easier than ever before to get into space. Another risk, which must be mitigated, is the potential for human error to cause a mishap. Whether a novice or lifelong aerospace professional, humans make mistakes—some have led to the most costly incidents in aerospace history. Consider, the units calculation error that led to the loss of the Mars Climate Orbiter, in 1999, to the tune of $125 million dollars; or, the $1.7 billion dollar, AEHF-1 Comm Satellite that was nearly lost because a piece of cloth was left in a critical fuel line. The Falcon Sat Program at the United States Air Force Academy (USAFA) is a program in which cadets and instructors work together to design, launch, and carry out missions aboard small space-craft. As the USAF Academy took on the challenges of building and operating small satellites with undergraduate cadets, they recognized the high risk of failure in having inexperienced students assemble flight hardware. Having a mishap with real flight hardware is not an option. With this concern in mind, leadership began to look for ways to reduce the risk of human error while “jump starting” the systems engineering experience of the students. What if students at the Academy, or in any organization, could gain experience on a low-cost “practice satellite?” One that would give them experience with “flightlike” hardware, but where failure (while not invited) would not set back the flight program. From this concept, EyasSAT was born. 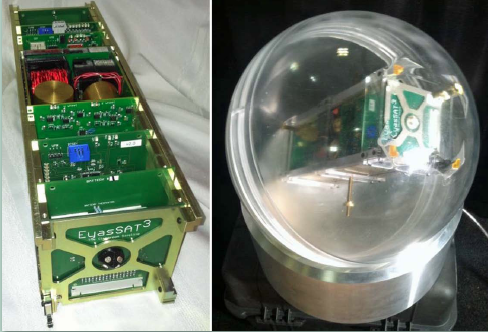 In the late 1990’s, USAFA1 formed a Cooperative Research and Development Agreement (CRADA) with a privately held company, Colorado Satellite Services (CSS), and commenced R&D on “EyasSat.” The name EyasSat comes from the Latin word for baby falcon, Eyas. 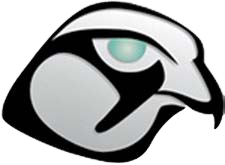 The falcon is the Academy mascot; hence, the Falcon Sat Program. In 2004 EyasSats began to be integrated into the USAFA academic program, starting with A331: Introduction to Space Mission Design. The EyasSat desk-top satellite has all of the subsystems of a typical spacecraft, including Power, with a solar array for Direct Energy Transfer, Thermal, Data Handling, Comm, ADCS, with control about a single axis (Z) using a reaction wheel and/or magnetorquers, and Ground Control Systems. While the look of EyasSat Trainers has evolved over the years (please see Figure 2), the basic functions remain the same. Figure 2. Original EyasSat, REV A on left; GEN 5 EyasSat , right. The intellectual property for the simulator was sold to EyasSat LLC in 2009 and, since that time, additional research agreements with USAFA have led to development of a beta, 3U cubesat simulator and a fully 3DoF air bearing test bed (please see Figure 3 on the previous page). EyasSat LLC is currently working to bring these designs up to commercial grade and cost-effective manufacturability. 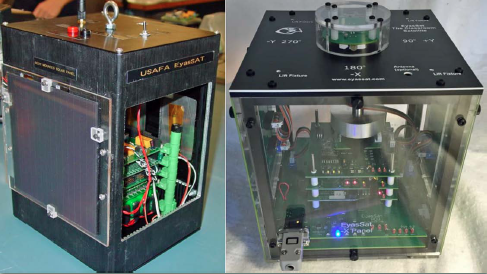 The basic differences between the 3U EyasSat and GEN 5 are the option for 3 axes control and conformity to the cubesat form factor; which, could be an advantage for those organizations where understanding the constraints of this form factor are critical. Regardless of the simulator format or the training context there is nothing comparable to hands on experience at any stage in the education and development of an aerospace professional. The visceral experience of seeing and handling hardware is invaluable. Fortunately, this person had been successful to that point by following protocol. Consider the value added to this team member’s skill set now that s/he can think more critically about the task at hand. When each team member can understand multiple aspects of a project it streamlines the process and increases the probability of catching a potentially fatal or costly mistake. Take the following scenario during system design: The payload requires more power than originally budgeted. The team goes to power and asks for more. The power team puts a bigger solar array and more batteries into the design. Does every member of your team have a systems engineering or space background? The most brilliant engineers in the world will not comprehend the unique constraints of designing a system for the space environment without the proper training and experience. Even with a solid design team in place, new personnel and technology innovations are coming onto the scene every day, making ongoing professional development crucial to mitigating risk. Whether USAFA cadet, a post doc at John Hopkins University, an officer at The School House at Vandenberg AFB, or an IT professional at an Indonesian Bank, all can benefit from hands-on training. For more information about EyasSat LLC or TSTI, please visit eyassat.com and tsti.net. 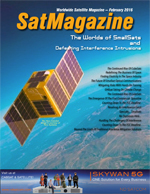 EyasSat, LLC offers two classroom satellites and accessories for practical, economical training purposes, for high school through graduate-level education and research and professional development throughout the smallsat industry. 1The original development team from USAFA included, Gen. (Ret.) Robert Giffin, Lt. Col. (Ret.) Jerry Jon Sellers, Lt. Col. (Ret.) David Barnhart, and Lt. Col. (Ret) John Clark. 2Teaching Science and Technology, Inc. (TSTI) offers space systems courses, like “Space System Verification and Validation” to customers around the world. For additional information, please visit www.tsti.net. 3Bank Rakyat Indonesia is the world’s first bank to own its own communications satellite. TSTI is the training provider for this project.